A recurrent meme running through recent posts of several of my fellow AnCaps (shonk comments here, mock does the same here and here) suggests that we've all independently taken to reading Ted Dalrymple at about the same time. Perhaps there's something in the water. I should mention that I've been following Dalrymple -- a retired British physician who has made a named for himself on this side of the Pond mostly on the strength of his contributions to the Manhattan Institute's City Journal -- for a number of years now, and at first, I did not think kindly of him at all. My impression has improved over time, but there remain a number of habits in his writings -- which consist largely of anecdotal accounts of the failures of multi-culturalism and the welfare state, culled from his experiences working with Britain's underclass -- that never fail to irk me. A gifted writer with an innate ear for evocative prose, Dalrymple's essays nonetheless tend to follow a pre-ordained formula. In part one, he offers a character sketch, or a number of related character sketches, about welfare-class patients, their numerous self-destructive habits, and their steadfast refusal to accept any sort of personal responsibility for the ails that have befallen them. In part two, he generalizes these stories as indicative of broader trends in society at-large, although usually without any supporting data. In part three, he offers his univeral diagnosis of the problem -- pervasive liberal permissiveness, albeit stated in a strawman form that few liberals would recognize as their own actual beliefs -- but tends to offer little in the way of prescriptions for treating it. 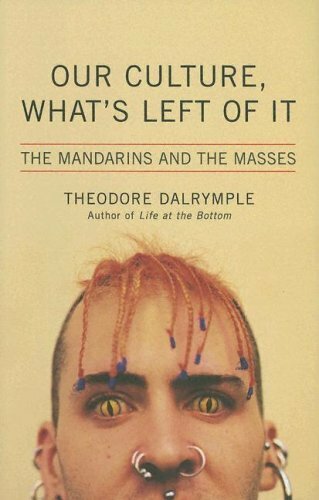 Invariably, Dalrymple sees trouble arising from the breakdown of customs that have generally served Western society well, and on this point, I'm broadly sympathetic, although his particularly British priggishness leads him to focus on a number of developments -- openly homosexual relationships, the popularity of tatoos among the middle class, the permeation of street slang into common language -- that don't tend to trouble me nearly so much as they do him. At other times, he hints that the solution lies in government sanction of various sorts of deviant behavior, though he leaves the details of such sanctions quite vague. If he were pressed to expound on the matter, I doubt his policy prescriptions would look much like any I would endorse. The London bombings may have caused at long last people to examine their fatuous multiculturalist pieties, which I believe are fundamentally derived from the restaurant model: today we eat Hungarian, tomorrow Mexican, the day after Lebanese, and so forth. Clearly, this is possible and very enjoyable, but there are more important and deeper things in life than a variety of cuisines. In Britain, if we had the courage to defend Moslem women, I think Islam would lose a lot of it residual attraction. Unfortunately, the Prime Minister's wife went into court shortly before the last election to defend a Moslem schoolgirl's right to wear 'traditional' costume - not traditional in Luton, by the way - I suspect to obtain the Moslem vote for her husband, and probably knowing, and certainly with the duty to know, the often abominable social meaning of this costume. Let us hope the recent events have taught the Prime Minister the folly - no, the sheer wickedness - of this. I was saying to my brother just the other day that it is possible to have a successful multiethnic and even multicultural society, but what cannot work is a multi-ethical society. Clearly everyone is not going to agree on all moral values, but there has to be one basic ethical standard in society. Without that the conflicts will be interminable and insuperable, and perhaps worse than that the tacit sanctioning of moral wrongs. ADDENDUM: My eyes are due for a check-up. The Selling Waves posts were from Curt, not (Original Flavor) Shonk.